BA in Furniture Design and Craftmanship, Bucks and Chilterns University College. BTEC National Diploma, Design (Crafts) at Rycotewood College. About me: My name is Mark Williamson, I am 31 years old, and I am a qualified and trained designer and maker of bespoke furniture. My company Mark Williamson is currently based in Ford, near Aylesbury, in beautiful Buckinghamshire. I have been passionate about working with wood from a young age, designing and making my own pieces, and I have won several awards for my designing and making skills. I won the prestigious National SkillBuild Cabinet Making Category three times between the ages of 18 and 22, whilst still studying at university. I also won The Woodworker magazine’s ‘Young Furniture Maker of the Year ‘ award. I gained much hands-on experience working for 7 years at Richard Williams furniture in Beaconsfield, where I was involved in making Guild Mark quality furniture. Away from work, I like to spend time with my wife Rachel (who is also very much involved in running the business), our son Felix, and our Labrador Retriever called Alfie, ideally spending weekends in Devon seeing family and walking along beautiful beaches. 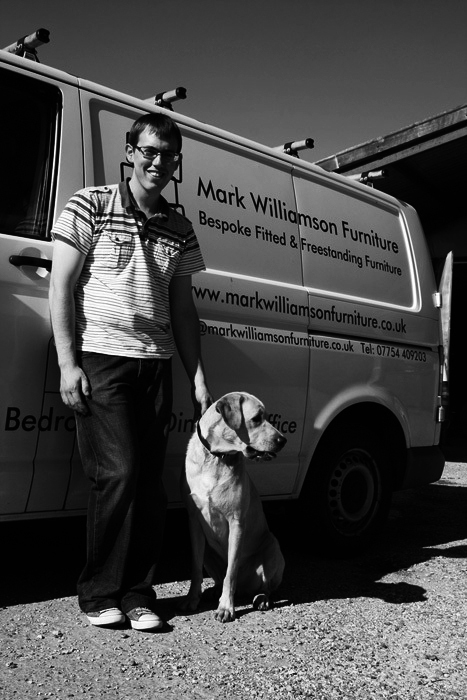 About my company: During 2012 I founded my own company, Mark Williamson Furniture, and moved into large workshop premises to be able to use all my experience, study, training and perhaps most importantly, passion for working with wood to design and make furniture for my own clients.